Just as we can’t quite imagine a warm and blissful afternoon by the pool … ! The winter months have certainly arrived for 2014 but us British types are a hardy bunch, so why not create extra space for parties at home by offering a marquee “shelter” in your garden? While arranging his own 50th birthday party – taking place in August this year, Mr. D quickly realised both the need for shade cover and the likelihood of rain to spoil his pool party idea. 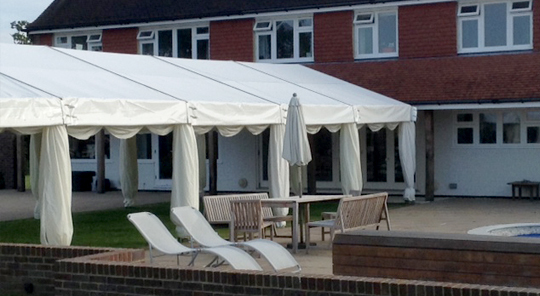 Having been recommended to ABC by a friend, he contacted us to ask about hiring a marquee roof, to maintain an open and airy feel for his party venue – his own back garden – complete with swimming pool – in Sussex. Having discussed his intentions – and the need for a touch of glamour – we suggested a 6m x 15m “open air” clearspan marquee frame with roofing and ivory linings. This was set a couple of metres from the pool over a small lawned area, to help maintain the outdoor ambiance even underneath the shelter. Find out more about our Marquee Lining Hire, Pricing or simply Contact Us for a bespoke quote to meet your needs.